The Yealink T41S is aimed at executives and managers who are looking for a feature rich phone but at a cost effective price. Similar to other phones in the T4 series, the T41S is an elegant looking phone and has all the powerful features you would expect from Yealink. 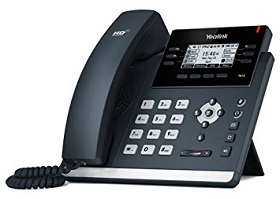 In this review we look at the pros and cons of the Yealink T41S IP phone and provide some tips on how to install and configure the device. In our opinion the T4x family from Yealink is one of the most elegant looking phone families in the marketplace. Even though the T41S is the lower end model in this family and only has a 2.7" 192x64 pixel monochrome display, it still looks stylish and the metallic keypad and texture bring an added dimension to the phone. The 6 line keys on the T41S may seem too few for some use cases but they can be configured for page mode where the sixth line key becomes a page button. This expands the phone to 15 programmable DSS keys, including Busy Lamp Field (BLF) functionality for easy one-touch transfers, call pickup and presence, providing your provider supports it. The T41S has a USB 2.0 connector which helps extends functionality. For example you can plug in a USB flash drive and use it for call recording, or connect a Bluetooth adapter (BT40) or even a WiFi adapter (WF40). The Bluetooth is useful for pairing with wireless headsets or even your cell phone and also for synchronizing remote contacts on a cell phone. There is also an RJ9 headset port that can be used to connect wired headset. Voice quality is great, as we would expect from Yealink. It supports all the standard Codecs, including high definition Codecs and Opus has been added. We recommend you take advantage of this if your provider supports it, especially if your Internet is not as consistent as you would like. The Opus Codec adapts in real-time based on network conditions and is therefore very powerful. The T41S is also Hearing Aid Compatible (HAC). Finally, the price is a huge plus for this device. Considering it is well under $100, it is surprising to see such a stylish and feature rich phone in this price bracket. UPDATE May 2018: Yealink now sells the Yealink DD10K USB dongle. 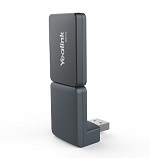 This can be used to wirelessly connect the T41S to the Yealink W60B DECT Base station that is typically used with the DECT cordless sets. For those with minimal Ethernet connections across an office, this can be a great way to add a high-end desk phone without needing WiFi or wired Ethernet ports in your office. The speaker phone on the T41S is reasonable but certainly not as clear as the handset audio. This is true for most speaker phones but I was expecting a little better quality for the T4 series. Reducing the speaker volume certainly helped. The Ethernet ports are 10/100BaseT rather than Gigabit. We found this a little surprising considering this is the T4 series and because there is little cost differential these days between 10/100 and 10/100/1000 Ethernet chipsets. It is missing a transfer button, most likely due to size constraints. This is certainly not a show stopper, since the soft keys can be used to transfer calls but even the lower end T2x family has a discrete transfer button. Stylish IP phone at a low cost (approx $86). 2.7 inch(192x64 pixel resolution) monochrome LCD. Up to 15 one-touch DSS keys with page mode. Supports up to 6 SIP accounts. The Yealink T41S desk phone would be a great addition to any executive or manager's desk. It looks very stylish and considering its feature set, it is great value for money at around $86. It has 6 line keys but can be expanded to 15 using the page mode. The USB2.0 connector can be used for WiFi or Bluetooth adapters or even a memory stick for call recording. Yealink T41S phone, handset and cord. 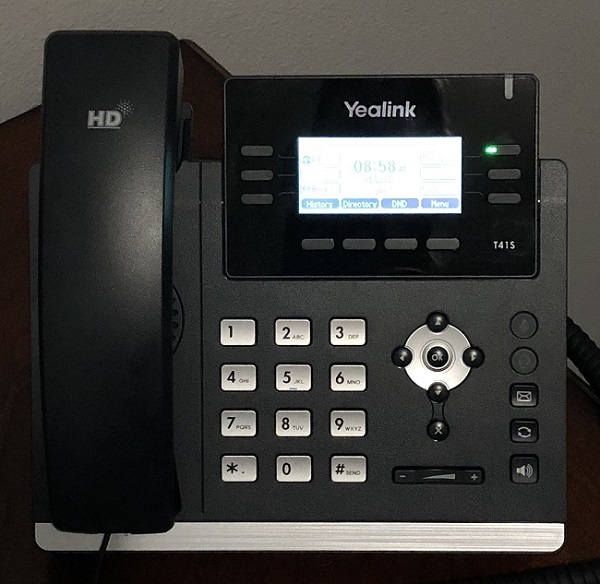 The Yealink T41S is easy to setup. Simply connect the phone as per the quick start guide that comes with the phone. All it needs is the handset connection to the phone, an Ethernet cable to your network and plug in the optional power supply, if you do not have a PoE switch. For the purpose of this review we will configure the phone using the Web console which is accessed through a Web browser. First of all, press the OK button on the phone. This should show the status for the phone, including the IP address. Using a PC on the same sub-net as the phone, type the address into the address bar of a Web browser (e.g. Firefox or Chrome). You should now see the login screen for the T41S. The factory default settings for username and password are both admin so enter those and then press the confirm button. You should now have access to the T41S Web console (also known as the phone portal). Press the Account tab and enter the details for Account1 based on the credentials given to you by your service provider. An example is shown in Figure 3 below. 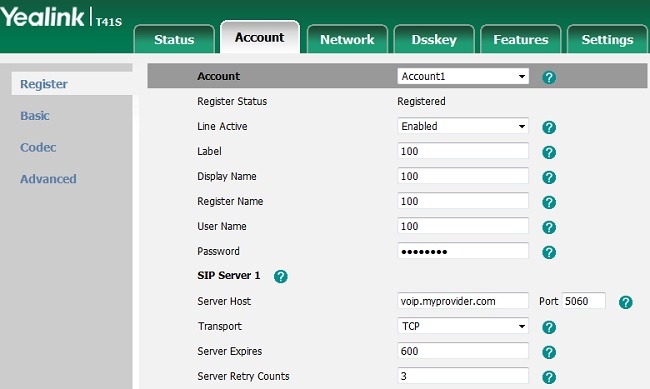 Save the settings and the T41S should register successfully with the provider's server. You can press the Status tab on the phone portal to see if it registered though the display on the phone tends to be the easiest way to see this. When registered the display will show a phone and there should be no X through the phone icon, it is replaced with a dot. We're sorry, there are currently no user submitted reviews for Yealink T41S matching your search criteria at this time. Please add your own review or check back later as reviews are being submitted often.